Over the past few years, there has been a tremendous increase in interest around habit forming products from a technology perspective. Loads of literature are available on this topic - be it books, blogposts, podcasts, courses etc. Given that it is one of my favourite subjects, I keep track of literature around the same. Two of my favourite books on this topic are Nir Eyal’s Hooked and Charles Duhigg’s The power of Habit. Now, why I’m talking of “habits” in the context of biscuits? Having a cup of chai (or coffee) every morning and evening is a habit for most of us. We also like to have a couple of biscuits to go with the chai. Parle-G biscuits used to be our default choice for many years, before the health-conscious behaviour took over and made us shift to Marie biscuits. Over the past decade, the digestive biscuits have successfully created a “perception” of healthier option over regular Marie biscuits. Let’s take the case of McVities Digestive biscuits. 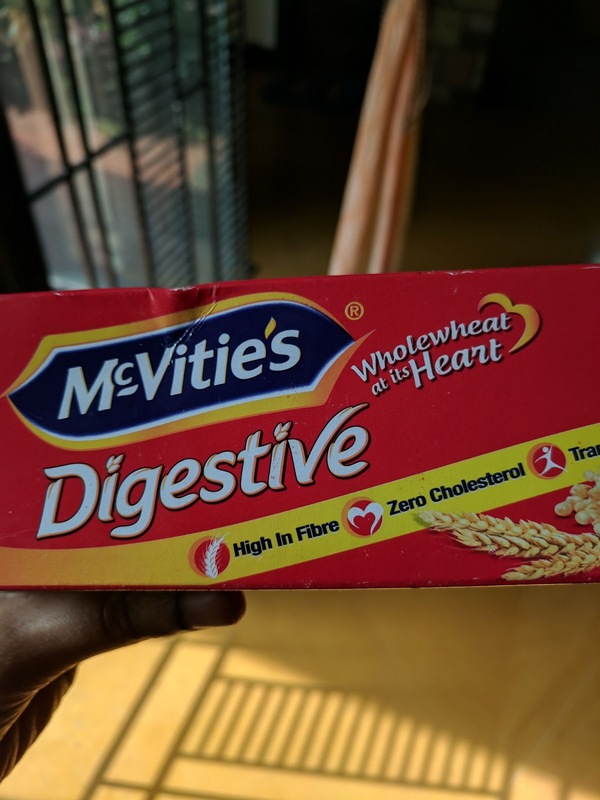 With a tagline “Wholewheat at its heart”, the brand’s messaging conveys that these biscuits are made of wholewheat and high in fibre as compared to regular Marie biscuits that are made of maida. Their website also talks of creating habits to stay fit, interviews with Kajol (who’s the celebrity endorser) on her fitness regime etc. Through their ads, the brand wants to incorporate these biscuits as part of a daily fit habit ("yeh habit hai fit") by tagging it with a pre-existing habit (chai routine). 1. As you can see, the very first ingredient is not wholewheat but maida. These biscuits have 43.3% maida and ONLY 15.3% wholewheat flour. The brand's “wholewheat” claim is absolutely false. 2. Most of these digestive biscuits are high on fats (second listed ingredient). Made with the cheapest oil that is bad for our health, environment and economy. For an intake of 3 biscuits, the fats that we would consume is 5.3 gms (around 1.2 tsp). This number might seem small or one might think fats are important for our body. What matters is the quality of fats. Our bodies need good fats from nuts and seeds. Not processed palm oil for God’s sake. 3. The brand’s claim of “high in fibre” also needs to be questioned. I guess what they meant is “high in fibre as compared to other biscuits available in the market”. If you eat 3 digestive biscuits, you would have consumed a measly 1.5 gms of dietary fibre, whereas one guava would give you 5 gms of dietary fibre (along with Vitamin-C, Vitamin-A and potassium). 4. Compared to Oreo and other cream biscuits, the sugar levels are relatively low, but that doesn’t mean these biscuits have negligible sugar. 3 biscuits contain around 4 gms or a tsp of sugar. If you are in the habit of adding 2 tsp sugar in your cup of tea, then you have already exhausted 3 out of 5 tsp of allowed added sugar in a day. Let’s not be fooled that such biscuits are a healthier choice. They are as unhealthy as any other packaged biscuits. Let’s be aware of their ingredients and NEVER succumb to such clever marketing gimmicks. 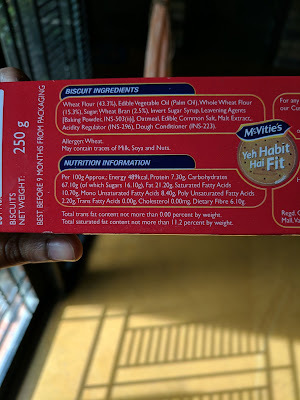 It is okay to eat the cheaper Parle-G biscuits once in a while, than have such "health-tag" attached digestive biscuits on a daily basis - "Yeh habit bilkul nahi fit"